Susan Walker Hartenbach left us peacefully surrounded by her loving family on February 11, 2019, at ThedaCare Regional Medical Center-Neenah, WI. Susan was born, Mary Susan Walker, on December 23, 1931, in St. Louis, MO, and was the only child of Clyde and Flora Walker. 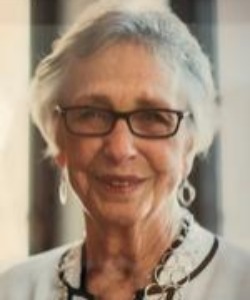 Susan attended Villa Duchesne High School and graduated in 1949. She then attended Georgetown University, Washington D.C., and St. Mary College in St. Louis. Susan married Henry C. "Hank" Hartenbach in 1951 where they then began their very busy life having been blessed with eight children. Susan loved to knit early in life, knitting socks for Hank and was known to take her sock knitting into the movie theater. As her children grew, she enjoyed quilting and was a long-time member of Lakeside Quilters of Oshkosh. She loved her golf and was one of the original organizers of the Thursday morning Shoot the Breeze Ladies League at Lake Breeze Golf Course in Winneconne, and continued to golf until she was 84 years old! Susan's most enjoyable passion was playing bridge. She played two or three times a week, making sure to not schedule any appointments on a bridge day. Susan is survived by her eight children, Lucy (Ann Hatch) of Appleton, Suzi (Patrick) Dowling of Fremont, Henry of Oshkosh, Annie of Winneconne, David of Mountain, Lizzie Williams of Appleton, Amy Penterman of Appleton, Maggie (Rick) Malott of Green Bay. She is also survived by her twelve grandchildren, Kate (Kyle) Wolf, Kalin (Adam) Roethig, Christan Dowling, P.J. Dowling, Matthew Hartenbach, Andy Hartenbach, Mike Hartenbach, Robbie Williams, Dan Williams, Charlie (Karen) Williams, Madaline (Selig) Will, Nellie (Selig) Olsen; and two great-grandchildren, Vera Sue Wolf, Charlie Williams, with one more on the way; and six loving step-grandchildren, Melissa, Wesley, Shannon, Heather, James, Katie. Susan was preceded in death by her husband, Henry C. "Hank" Hartenbach; son-in-law Herman A. Penterman; and her parents, Clyde Alden and Flora Agnes Mitchell Walker. A visitation for family and friends will be held on Saturday, February 16, 2019, from 9:00 to 11:00 a.m. at St. Mary Catholic Church, 210 Pleasant Drive, Winneconne. A funeral Mass will be held on Saturday at 11:00 a.m. at the church followed by graveside services at Winneconne Cemetery. In lieu of flowers, donations can be made in honor of Susan to Fr. Carr's Place 2B, 1965 Oshkosh Ave., Oshkosh, WI 54902. The family would like to thank the staff at Evergreen Rehab Unit and ThedaCare Hospital in Neenah for their kind and compassionate care of our mother. She will be missed by all. Sympathy to the Hartenbach family, prayers are with you! Thinking of you. Your Mother was a lovely lady and will be missed by all. Our deepest sympathy. Our deepest sympathy to all of your families. She was a beautiful lady who loved her golf! Thoughts and prayers are with you.